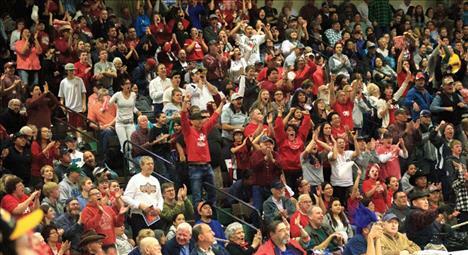 GREAT FALLS — With a huge presence of fans pulling for the Arlee Warriors, the team brought home second-place state hardware after a successful season of 25 wins and just two losses. 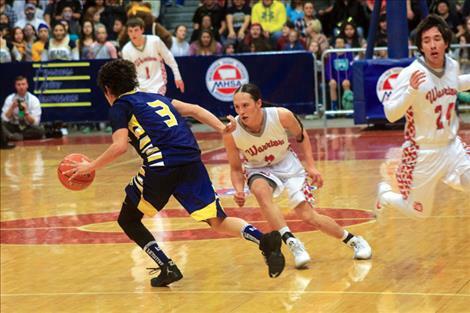 The Warriors found themselves playing against Box Elder in the State C Championship game on Saturday, March 5, but it took some work to get to that point. The Warriors stomped on Culbertson in the first round of the tournament on Thursday, March 3 with five players scoring in the double digits. Tyler Tanner led with 16 points, Philip Malatare added 13, Brad Brazill put up 11, and Patrick Bigsam and Greg Whitesell each threw in 10 points. The Warriors beat Culbertson 85-46, which sent them into Friday, March 4 semifinal game against Belt. Belt beat Arlee last year in the 2015 State C seminal game 67-65, so Arlee was looking for redemption this year. In the first quarter, the Warriors were leading by 2 points; however in the second quarter, Belt led the game 31-29 going into halftime. It was Warriors’ Phillip Malatare who took the second half into his own hands. Malatare, who had 30 points on the night, scored 14 points in the third quarter to tie the game 46-46 going into the final 8 minutes of play. Malatare and Tyler Tanner combined for 54 of the team’s 69 points, however it was Patrick Bigsam who put the final touches on the semifinal game. Bigsam hit a 3-pointer in the final minute, which put Belt down by just enough for the Warriors to run away with the win. The Warriors beat Belt 69-63 and also gave the team a chance for a state title the following night. The Arlee Warriors, with a season of 25-1, were looking to continue their successful season with one final win against Box Elder. The Warriors trailed Box Elder in the first quarter 12-13, but Box Elder continued to pull away. Malatare fought to keep his team in the game, scoring 33 points on the night; however it just was not enough. Box Elder beat Arlee in the title game, 95-73. 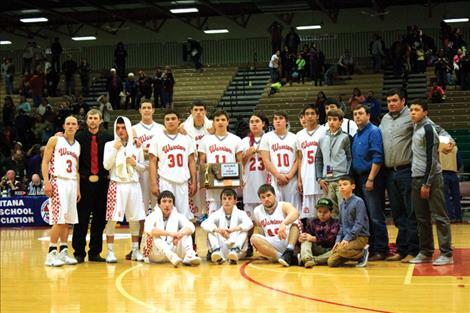 The Arlee Warriors ended their season with a 25-2 record and will be cheering on the Arlee Scarlets at their State C Tournament starting Thursday, March 10 in Great Falls. This is the Scarlets’ first trip to state since 1981.